Hey Love: Mixing It Up! Hey Loves! Happy Monday!! I hope y'all had a good weekend! Mine was pretty hectic! We have a sick horse on our hands and spent all Saturday at a specialist. Craziness.... But, she's doing better so hopefully the worst has passed. Moving on.......... on a lighter note, have y'all seen the commercial for White House | Black Market with the dancing! So cute! Love tap dancing! Have you entered my Shabby Apple Giveaway??! Tomorrow is the last day! 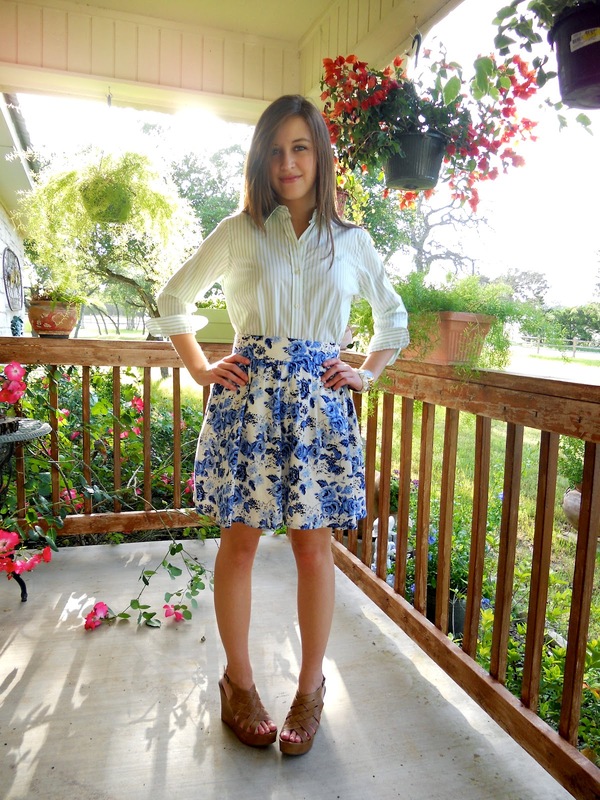 Adore your floral skirt - it's pretty, feminine, & so perfect for Spring/Summer! Beautiful photos :) And hopefully your horse pulls through just fine; I know how awful times like that can be! love the mix of prints and your SHOES! Love the floral skirt. Hope your horse is feeling better! Lovely skirt, I love all your photos you're home looks so warm and lovely. Hope that everything is fine now. Keep up! i love it! the skirt is so cute and perfect for Spring! I love how you mixed the prints and that floral skirt is so cute! I hope your horse feels better Giovanna! You look pretty Giovvana! Hope your horse is recovered by now!! Love your skirt!! You look so pretty! 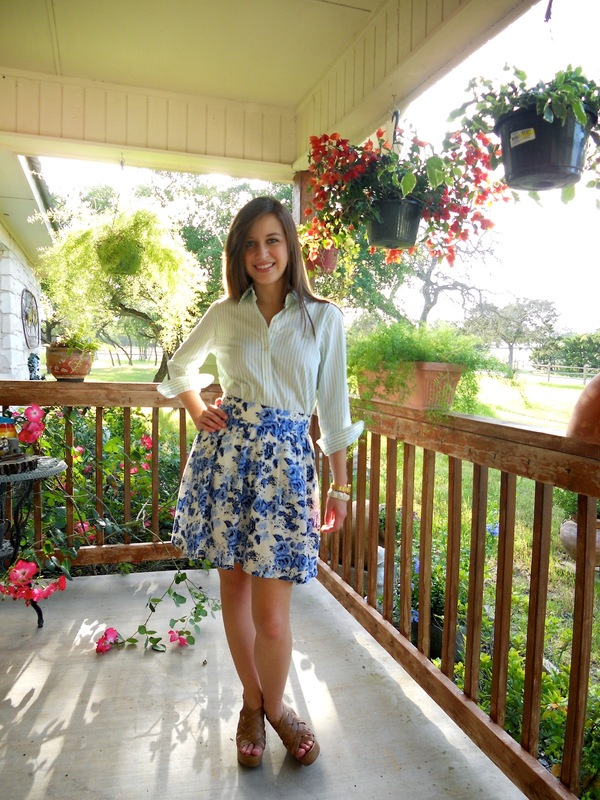 What a pretty floral skirt, Giovanna! I love this outfit! I'm never really sure how to style collared shirts! Cute skirt! I'm a new follower! Want to follow me back? I hope your horse feels better! Stripes and floral never look so good! Super cute skirt. I really like that print -- great for spring. Great look. I love the classic shirt with a jazzed up skirt. So classic and trendy at the same time! Great outfit! Love your wedges! And glad to hear your horse is feeling better. I love your skirt! Of course I love florals! What a sweet little skirt! I can see an entire bedspread modeled after that blue beauty...bits of florals here, a fresh punch of white there...great mix! Super cute skirt!! Great pictures too. I love this outfit - the shirt with the skirt, so beautiful. I'm bummed that its an old purchase though, because I want it!! I'm on the hunt for a floral skirt. You always rock florals so well!! :) And I hope your horse gets better! I love how you let the skirt be center of attention. Gorgeous outfit! you look really cute and love the whole setting on the first images... Have a nice week! I hope the situation with your horse is much improved! Love your blog! and your floral skirt is so cute! Very cute outfit! Love mixed prints! You have such a cute blog! I'll definitely be following. Thanks for your comment on mine! Hope you'll visit again soon! Cute skirt! =) Looks great on you! OMG! How pretty are you!! Love the mix up of florals and stripes! Hope you are having a wonderful day! That is one lovely skirt and love how you mixed the florals with the stripes! You look adorable, girl! That skirt looks like a china set - it's gorg! Cute look, love the shoes a lot! thanks for visiting and add comments on my blog.. Very nice outfit, the girlie skirt looks perfect on you! What a great outfit! I love your skirt so much!! Oh, we have a horse too, hope yours is okay!! Your blog is great, love the fashion! Love that skirt and your porch! So cute! this floral skirt is so cute and so spring! love it girlie! Your skirt it to die for! thanks for stopping by my blog (diy gold painted art). for some reason i couldn't reply (blogger issues or something). i love your blog and i'm so glad you found me! can't wait to see more outfit posts! Wow, this look is absolutely darling! wow what a cute outfit!! I just found your blog and it's amazing :) ur outfits are all so nice... love your skirt in this post!